Isobar Sweden has won Silver at the prestigious Guldägget (The Golden Egg) Awards for Show Your Colours, a campaign for betting company, Betsson. The Swedish Association of Communication Agencies has organised The Golden Egg Award since 1961, making it Sweden’s oldest, largest and most prestigious creative award for the advertising industry. The team’s winning work for Betsson in answer to a complex brand challenge - to be the number one betting company associated with Allsvenskan – Sweden’s top football division – in a market which is highly saturated. To break through this noise, Isobar needed to come up with something out of the ordinary. Based on the insight that football fans are passionate about their teams, and are willing to do almost anything for them, Isobar launched a game called Show Your Colours. 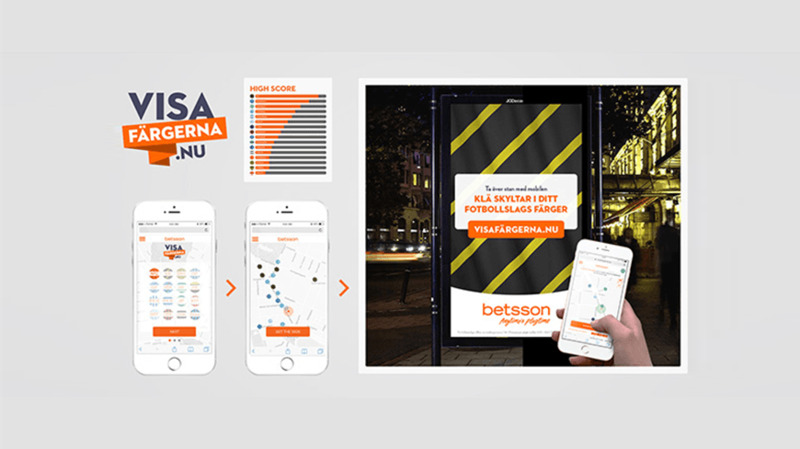 The Isobar Sweden team and Betsson gave fans access to over 52 digital out of home units in the heart of Stockholm, allowing fans to paint the city in their team’s colours using their smartphones. Fans were urged across social media, football podcasts and banners to sign up to the game using the dedicated site, and begin activating their team’s colours on the digital out of home units. The more signs fans changed to their team’s colours, the bigger the reward, with the ultimate prize being 30,000 Swedish Krona (approx. £2,500). During the campaign, the number of Allsvenskan bets placed on Betsson rocketed by 410%, and new customers also increased by 21% compared to the premiere weekend of Allsvenskan last year, beating the targets set prior to the campaign. To find out more about the award and the work, contact Carl Lundgren.